Solution 2 in 1 line – Turati Idrofilo S.p.A.
Patented worldwide novelty : dry make-up remover wipes, water activated. 100% natural, practical and good value for money. Only the best for the skin of our consumer! Cotton Plus Solution 2 in 1 seems a regular cotton pad but in fact is a dry, extra soft make- up remover wipe with a heart of cleanser which gets activated by adding water, only when you need it. To remove or correct make-up smudges slightly moisten the wipe only with water, do not squeeze it, hold it against your closed eye/face for about 20 seconds and gently wipe off make-up as usual. Clinically tested, Nickel tested and hypoallergenic. Besides make-up removal action, Cotton Plus Solution 2 in 1 takes care of your skin since it is rich of cosmetic actives with several beneficial properties. Leave the skin soft and pleasantly scented. Research, development and innovation at the service of consumers: thanks to your ideas and suggestions we have got the patent for industrial invention, but what makes us most proud is that we have simplify daily make-up removing with a solution 100% natural, practical and good value for money. Our products are suitable for mass retail channels, supermarket chains, retailers, wholesalers, medical facilities, pharmacies, perfumeries, herbalists, etc..
100% NATURAL. Clinically tested, Nickel tested and hypoallergenic. No alcohol content, preservatives or parabens. Passing all the more rigorous safety tests for skin and eye irritation, we have achieved compliance with Cosmetotextiles European Directive PD CEN/TR 15917:2009. Patented worldwide novelty MADE IN ITALY. Contact us for more information. Slightly moisten Cotton Plus Solution 2 in 1 only with water, leave on the skin/eyes for a few seconds then remove make-up as usual. Very important: you should not squeeze it after water adding. Rinse free and quick dry. Cotton Plus Solution 2 in 1 is a dry, extra soft cotton wipe, with a pleasant scent. Two sides, two functions: the striped side effectively removes face and eye make-up just with the water addition, the smooth side gentle complete make-up removal routine with accuracy. Why is a patented worldwide novelty? When we think of make-up removers, we usually think of pre-moistened wipes or cotton pads that we soak with a solution. In the market there were only these kind of products until Turati Idrofilo S.p.A. invented and patented Cotton Plus Solution 2 in 1. It is a revolutionary and thrilling innovation in make-up removal world, unique in its class of product. Cotton Plus Solution 2 in 1 is a dry, extra soft cotton wipe, you simply add few drops of water to activate cleanser, and you get your make-up remover! Besides make-up removal action, Cotton Plus Solution 2 in 1 takes care of the skin since it is rich of natural cosmetic actives with nourishing and moisturizing properties. Why is it better than wet wipes or cleansing lotions? Compared with regular make-up removal products, Cotton Plus Solution 2 in 1 is very practical and good value for money. 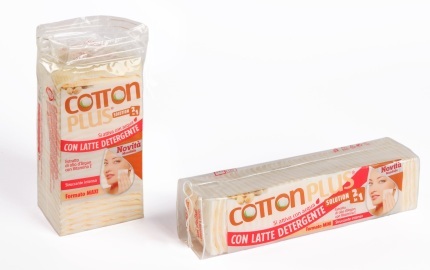 Based on a study among make-up removal products in the Italian market, Cotton Plus Solution 2 in 1 costs 75% less compared to wet wipes and 65% less compared to traditional cotton pads with the cleansing lotion addition. Cotton Plus Solution 2 in 1 is perfect to travel: it checks with you because is dry and moreover it is lighter and does not take up space in your suitcase or in the hand luggage! Cleansing lotion is a very good option for make-up removal, but it needs several products to combine with. First of all cotton pads, tonic and further an after make-up removal moisturizing lotion. 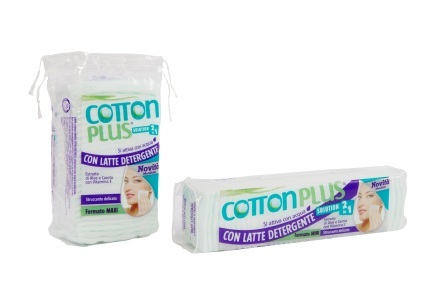 With Cotton Plus Solution 2 in 1 you have all these products just in one pack! Cotton Plus Solution 2 in 1 will not irritate your eyes and your skin. Rinsing is not necessary and after use your skin will be soft, moisturized and scented. You won’t feel the need to apply any other products. So far wet wipes have been the most convenient solution to carry with you all the time, travelling, at work, etc. Nevertheless a lot of types are sold, they may contain alcohol, parabens, preservatives, silicones, paraffin, because of that they are generally aggressive for the skin, not suitable for sensitive skins. Most of all, once opened the pack, it is necessary to use wet wipes within a short time otherwise they may dry out and be wasted. Cotton Plus Solution 2 in 1 is not wet and it gets activated with water only when you need it: hence, once opened, it does not dry out, does not lose its fragrance and it keeps unchanged its properties until used. But most of all Cotton Plus Solution 2 in 1 is 100% natural! Choose the best for your skin, choose a product clinically tested, hypoallergenic, nickel tested, no alcohol, preservatives or parabens content. Try it travelling, and you will not go on without it any longer – even at home! Clinically tested, nickel tested, no alcohol, preservatives or parabens content. Cotton Plus Solution 2 in 1 infused with Aloe Vera and Carrot extracts and Vitamin E is perfect as morning and night skincare routine. You can use it for your daily face cleansing, its ingredients are natural and hypoallergenic. It leaves your skin fresh and clean, gently perfumed. Suitable for removing mineral and light make-up, face powder, blush, eye shadow and foundation. QUALITY: 100% NATURAL. Clinically tested, Nickel tested and hypoallergenic. Does not contain alcohol, preservatives or parabens. Passing all the more rigorous safety tests for skin and eye irritation, we have achieved compliance with Cosmetotextiles European Directive PD CEN/TR 15917:2009. Patented worldwide novelty MADE IN ITALY. Cotton Plus Solution 2 in 1 infused with Argan oil extract and Vitamin E is perfect for heavy and eyes makeup removing. Rich in natural cosmetic actives and Vitamin E, it takes care of your skin nourishing and moisturizing it. Suitable for removing eye make-up, in particular eye pencil, eyeliner and mascara. Don’t miss our video, subscribe to our Youtube channel! Wide range of 100% cotton wool products for personal care, perfect for any make-up removing, hygiene and daily cleansing needs. Wide range of 100% cotton wool products, perfect for professional use in cosmetic and medical sectors.